Ok, this is probably more achievable. Forget the arduino rails for now and use the existing latches for parallel I/O – I can try the PIO later. This is the protoboard on top of the cpu board with the serial/power connection at the left. 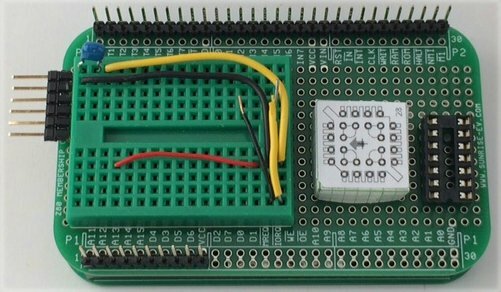 Next is a protoboard, then the PLCC socket for the TP3465 SPI chip, then a random socket to represent fixed glue logic for the spi chip although some could also go on the protoboard. Depending on the actual sizes of things I might have room for more glue. The through-hole pattern for the 28 pin PLCC socket is printed on top of my mockup. It has address and data lines that would be hard wired to the CPU board at the P1 connector and the usual chip select/read/write pins that will require thought and glue. Some of the select pins and certainly the SPI I/O pins I’ll bring out to male headers somewhere on the board. I think actually the protoboard might go at the right rather than the left so it can hang over the end if needed. Matt Millman used the TP3465 chip in his 80D 8086-based arduino-workalike so i should be able to crib some stuff from him. Boy, you had better enjoy that TP3465 while it lasts, because it is not going to be in production for much longer! That said, you won’t be disappointed with it.